Think furniture: As Seen on TV: Him and Her Chairs by Casamania. Do you ever watch TV and go "Ohhh where do I know him/her from?" Although this not the first time we have spotted some of our furniture on TV. Regular readers might remember our article last year on the Apprentice chair the Interstuhl Silver Chair. 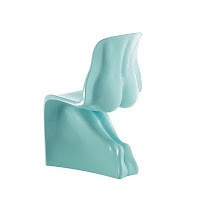 The Him and Her chair from Casamania is one of our more unusual items featured on our website. They are made out of rotationally moulded polyethylene using a three dimensional scan of two plaster sculptures. 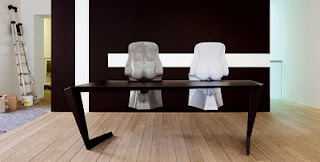 The Him and Her chair was intially inspired by the Vitra Panton Chair and follows the same shape. So if you spot some of our furniture on TV tell us about it and you may win a lovely little prize. Or you see a particular piece of furniture on TV that you want challenge us to find it! To find out more about the Him and Her chair by Casamania click here. Labels: As Seen on TV: Him and Her Chairs by Casamania.